There is nothing we love more than good design meeting up with a good cause. That’s why we love this student humanitarian design project on the Thai Burmese border: it combines beautifully designed (and super efficient) vernacular-inspired architecture with social responsibility in aiding the plight of Karen refugee orphans. Five students in Thailand are using architecture to make new lives for 24 orphans by providing them with homes to call their own. 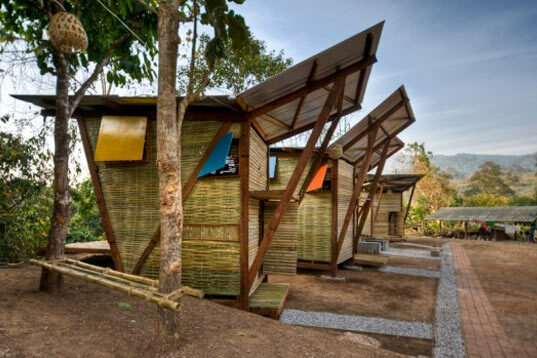 Humanitarian design organization TYIN Tegnestue from the Norwegian University of Science and Technology conceived the project in response to a need for more dormitories for Karen refugee children in the village of Noh Bo on the Thai-Burmese border. 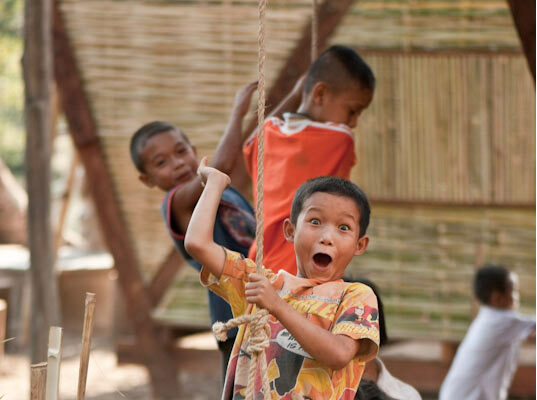 The six woven bamboo huts, dubbed Soe Ker Tie, or The Butterfly Huts because of their “winged” appearance were designed with the children’s happiness and health in mind. As simple as these new dorms may seem, they provide something wonderful for a growing child – a space to call their own to learn, sleep and play in. This small luxury is one that so many of us take for granted but makes a huge difference in the development and happiness of these youngsters. Aside from giving 24 orphans brand new homes, the huts are pre-fabricated and assembled on site with sustainability in mind. Most of the bamboo used is harvested locally and woven in the same way that is traditional to the area. The special flapped roof of the Soe Ker Tie House is conducive to natural ventilation. Since the roof also collects rainwater, areas around the huts are more useful during the rainy season, and water can be stored during drier periods. Using foundations cast in repurposed tires, each hut is raised above ground level preventing issues that could arise due to moisture and decay. “After a six month long mutual learning process with the locals in Noh Bo we hope that we have left something useful behind. Important principles like bracing, material economization and moisture prevention may possibly lead to a more sustainable building tradition in the future,” says TYIN of their experience. To balance out the success of their endeavor, they also point a negative aspect of the project. Since most of the materials used are delivered by the Karen National Union on the Burmese side of the border, their dependency on tropic timber has led to a line of difficult and complex problems which they hope to find solutions for in the future. Beautiful! I would love one. Are there gutters and rain barrels? What about little gardens to tend and eat from? I would like to bring something like 'the Butterfly House to Africa, too many people here strugle with life. Time to hwlp others and not just feed our own greed. Wow, I wish all social housing could be like that! Nice and simple deigns and a good project for all concerned. I can see this design being successfully used in Brazil. Side by side these dwellings arelattractive, sustainable, and low cost. flat roofs? What about monsoon season? why not merely use the local design for the houses... 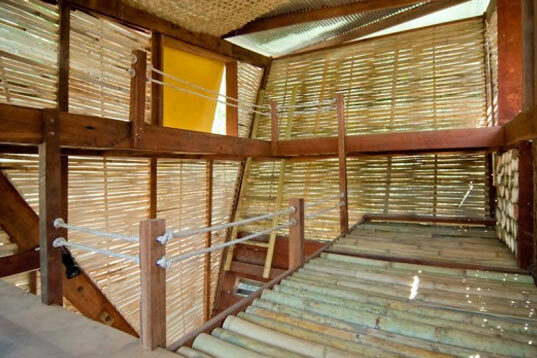 Traditional Philippine houses are bamboo, with thatch roofs, and often three level (ground floor to cook, and a raised area for sitting and sleeping). The roofs are usually pointed, so the rain can run off easily. By using traditional design instead of "prefab" it means you can use local builders and local supplies, saving money and giving locals jobs. There is nothing we love more than good design meeting up with a good cause. That's why we love this student humanitarian design project on the Thai Burmese border: it combines beautifully designed (and super efficient) vernacular-inspired architecture with social responsibility in aiding the plight of Karen refugee orphans. Five students in Thailand are using architecture to make new lives for 24 orphans by providing them with homes to call their own.